'But we have only five loaves of bread and two fish,' they answered. 'Or are you expecting us to go and buy enough food for this whole crowd?' For there were about 5,000 men there" (Luke 9:12-14). Those disciples sure could get snarky at times, couldn't they? "Are you expecting us to go and buy enough food for this whole crowd?" Lol! As much as I love their snark, that wasn't the line the captured my attention when I read the story this time. I kept coming back to Jesus saying, "You feed them." I'd read a few lines and my eyes would drift back up to those three little words. You feed them. Read a little farther in the story, then drift back up again. You feed them. As I thought about those words throughout the day, I also thought of a couple of other verses. In 1 Corinthians, Paul wrote, "Dear brothers and sisters, when I was with you I couldn’t talk to you as I would to spiritual people. I had to talk as though you belonged to this world or as though you were infants in Christ. I had to feed you with milk, not with solid food, because you weren’t ready for anything stronger" (1 Corinthians 3:1,2). The writer of Hebrews wrote, "There is much more we would like to say about this, but it is difficult to explain, especially since you are spiritually dull and don’t seem to listen. You have been believers so long now that you ought to be teaching others. Instead, you need someone to teach you again the basic things about God’s word. You are like babies who need milk and cannot eat solid food. For someone who lives on milk is still an infant and doesn’t know how to do what is right. Solid food is for those who are mature, who through training have the skill to recognize the difference between right and wrong" (Hebrews 5:11-14). In both cases, teaching people about God is compared to feeding their physical bodies. Teaching them about God is feeding them spiritually, beginning with the simple truth of His love and progressing on to them learning to tell right from wrong on their own. 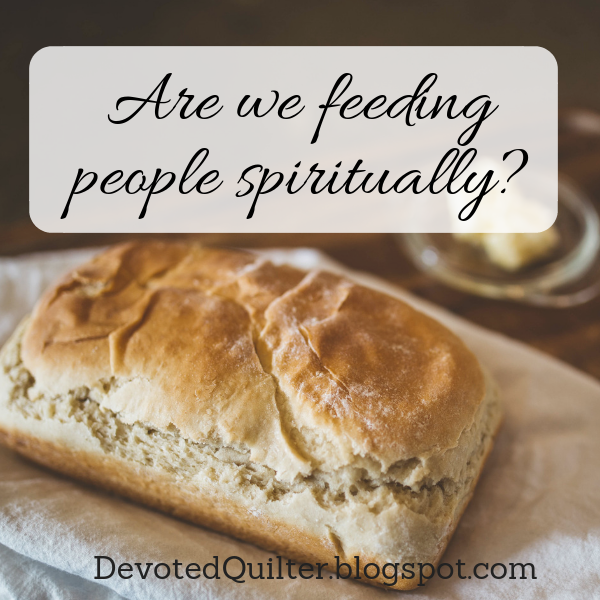 Obviously, in the story about the loaves and fish, Jesus was telling His disciples to feed the people physical food, but I couldn't get away from the thought that God also wants us to be feeding people spiritually. To be teaching them about Him, about how much He loves them, about Jesus' death on the cross and His resurrection, about salvation through faith. We often feed other people physical food, whether it's our spouse, our children, extended family or friends, sometimes even strangers. Are we also feeding the people around us spiritual food? Are we teaching our children or grandchildren about how much God loves them? Do we share our faith with extended family, friends or strangers? That's food for thought, isn't it? That's a challenge, isn't it? And it's so easy to say, I already do this, this and that - as if there's a limit to what we can do. Others (myself included) point to others, asking what THEY'RE doing - but that's between themselves and God. I'm only responsible for what I do (or don't do) - and I can and should do more. Thanks for the nudge!